On the Web - Whether you are a hobbyist or breeder, there comes a time when you consider purchasing a reptile rack system to house the growing number of animals in your collection. In this article we will discuss the pros and cons of three of the more popular reptile rack systems on the market. We will also touch on the option of building your own rack system to suit your individual needs and budget. This is part two of the Breeder Basics series by Brittney Gougeon. Ball-Pythons.net - A member is very pleased with their recent rack purchase from RBI. Ball-Pythons.net - How well do they maintain humidity levels when paper substrate is used? Ball-Pythons.net - Members recommend a variety of brands and manufacturers to buy a new rack system from, sharing the successes they’ve had with each. 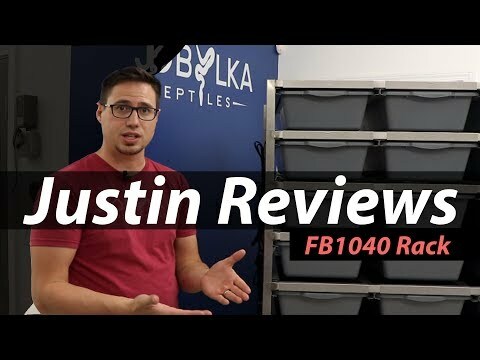 YouTube - Justin Kobylka puts together and reviews his new Freedom Breeder 1040 reptile rack. Justin will tell us about this rack and its different options and design features.